Have you made Capellini Pomodoro? 1. Heat olive oil and add garlic; cook until it turns white. 2. Add tomatoes and pepper and heat through, stirring constantly, about 2 to 3 minutes. 3. Tomatoes should not lose their shape. Remove from heat. 4. Transfer hot, cooked pasta to large bowl. 5. 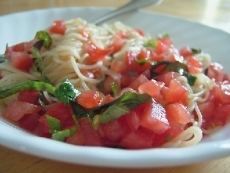 Toss pasta gently with tomato mixture, basil and half of Parmesan cheese. 6. Serve immediately and pass remaining Parmesan. Was wonder-full! As good as any I have had at expensive Italian Restaurants in my ome town of Santa Barbara, CA. This was really good! I substituted dried basil and some tomatoes on the vine for what the recipe called for. It was a hit here. This recipe is high in Vitamin A with 27% of your daily recommended intake per serving. This recipe is high in Vitamin C with 33% of your daily recommended intake per serving. This recipe is a good source of Vitamin E with 11% of your daily recommended intake per serving. This recipe contains potential food allergens and will effect people with Wheat, Gluten, Tomato, MSG, Cheese, Garlic, Olive Oil allergies.